Customers line up at a KFC in Beijing. 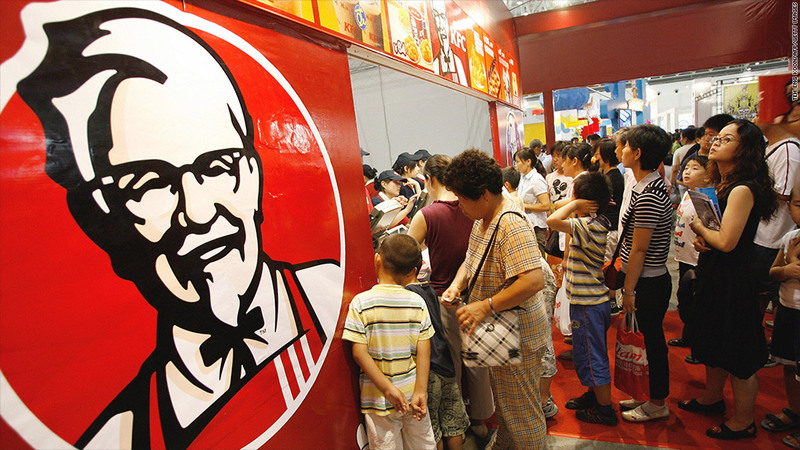 Trouble continues for Yum Brands in China. The fast-food giant said Wednesday that its March same-store sales in China had dropped 13%, as it continues to grapple with the fallout from a food safety scandal. Yum operates more than 4,200 KFC restaurants in China, along with over 800 Pizza Huts. Customers began deserting the restaurants in droves late last year after an investigation by Chinese food regulators found excessive levels of antibiotics and hormones in some chicken products sold at KFC locations. The contaminated chicken was traced to two KFC poultry suppliers, sparking calls for a boycott among Chinese consumers. Yum Brands' (YUM) China sales began falling as a result starting in the last two weeks of 2012, and worries about food safety have intensified in the country amid an outbreak of bird flu that has killed nine people. "Within the past week, publicity associated with avian flu in China has had a significant, negative impact on KFC sales," Yum said in a securities filing Wednesday. "Historically in these situations, we have educated consumers that properly cooked chicken is perfectly safe to eat, and we will continue to do so." Yum (YUM) shares sank 2.6% in after-hours trading. China is a crucial part of Yum's business, accounting for 42% of its profits last year. Yum warned in February that its slump in China would cause its 2013 earnings to drop and revised its earlier guidance. Sales from the company's China division fell roughly 20% in the first two months of this year.